The IKA Digital block heater for one aluminum block offers precise temperature control in small vessels. The PT-1000 temperature sensor that is included allows temperature control directly in the sample vessel. 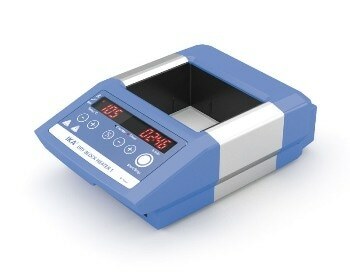 It is used with PCR tubes, microplates, Greiner tubes, PCR strips, and cuvettes. The block heater is suitable for boiling and melting point determination, enzyme reactions, immunoassays, DNA denaturation, incubation and activation of cultures, coagulation tests, blood-urea-nitrogen determinations, culture media tests, and in situ hybridizations.